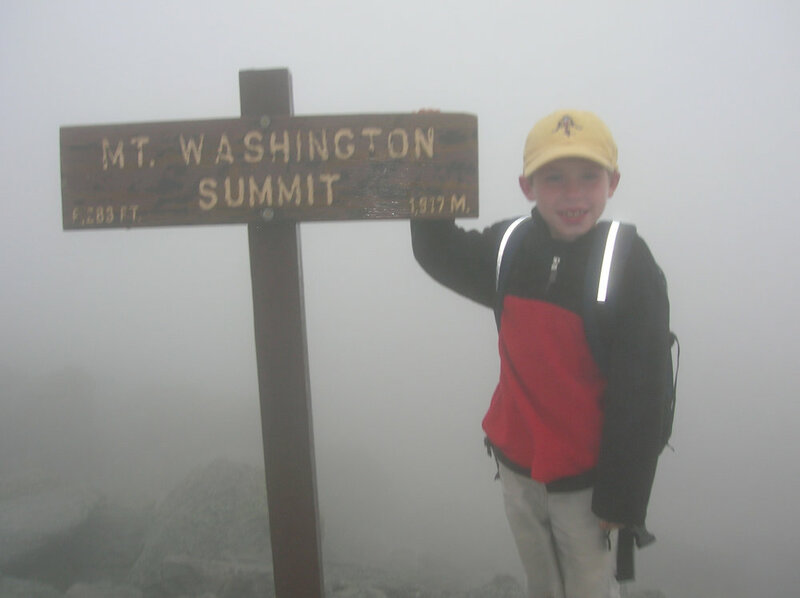 My son and I started hiking New Hampshire's White Mountain 48 peaks over 4000 feet in August 2006 and completed the journey in October 2016. We didn't set out to begin peak bagging, it sort of happened after finding our way to the summit of Mt. Washington via Tuckerman Ravine. In the end we had hiked close to 300 miles of challenging terrain in all seasons, weather, and time of day. Some hikes were short sprints, others long hauls, unsuccessful hitchhiking, some lucky rides, and a little bushwhacking. I am proud of our accomplishment together and it provided me a yardstick by which I watched my son grow from a 7 year old boy into a confident, self-aware and engaged young man. The definitive guild for New Hampshire's 4000 footers is the AMC White Mountain Guide. It is packed with trail guides for the White Mountain National Forest plus it includes several excellent topographical maps. The AMC has also developed the White Mountain Guide Online, it is a little clunky but provides an easy way to establish a trail plan. It also includes stats about the hike, which is fun. For the price, I found it well worth the membership. However the best resource I found when it comes to the "Well, which way should I do this?" or "Where can I sleep on the trail?" questions is this list. I have no idea who maintains it, if you find out please drop me a line as I owe the creator a great personal thanks. The AMC Guide is definitive, but that also means quite complete. The list here is straightforward, with commonly used routes and tips on the trail. I highly recommend it and I referenced it first for every hike I took. Once you get started, it is only a matter of time before you start tracking your peaks. The official site is the AMC Four Thousand Footer Club, which provides a lot of good information about peak bagging the 4000 footers. GPS has provided a good tool for making sure you don't have to call Search and Rescue, however I highly recommend that anyone venturing into the woods know how to read and use a topographical map and a compass. Topos are less useful in the White Mountains than they are in the West, as the cover is often thick. But in pinch it might be the thing that saves you. GPS units can fail, run out of power, and are (relatively) heavy. When every ounce counts, be sure to have the right tools for the job. National Geographic recently made available (for free!) USGS topographical maps. The site is certainly worth exploring. Consider joining or donating to the Appalachian Mountain Club, or other local groups which take responsibility for maintaining trails and the natural resources in the White Mountain National Forest. You can get involved in lots of good stuff, if you are so inclined to give back a little. Like many of us, I learn the hard way. Here are a few tips I picked up on the journey. This information is just a starting point, so do your own research and gauge your experience before heading out. Drop me a line if you have additions, I'll be happy to add and credit them here. Weather - Yes, the weather in the Whites is notoriously dangerous and unpredictable. Be sure to understand what you are getting into, regardless of the time of year. I've seen snow flurries in August, skied from the Mt. Washington summit in a tee shirt in April, and experienced gale force winds and fog at tree line only to find a balmy 70 degree day in North Conway later that day. Do not underestimate the weather. If unfamiliar with alpine hiking, talk to fellow hikers or ask questions on social media. In the end, get informed and be prepared. Trail Plan - It is a good idea to plan your trip before slapping on a backpack and striking out into the woods. Terrain in the Whites can be varied with elevation gain an important and significant variable. Some hikes have large exposure or ladders that may be challenging before you've gotten your legs. So know where you go. Also, leave a copy of your plan, departure and expected return times, with someone you know. This way if a twisted ankle happens after dark, you might have a chance of not sleeping unexpectedly in the woods. Clothing - You've heard it before, dress in layers. Elevation and wind can change a nice 70 degree day into an uncomfortable hike, especially above tree line. Avoid cotton, as it holds the sweat and can cool you when you stop moving. You don't need to spend a lot of money on name-brand clothing, but it needs to be effective. Summer gear for me typically includes hiking shorts, a base short sleeve shirt, a thin fleece insulating layer, and a wind breaker or hard shell. Unless the forecast is for spectacular weather, I usually bring a hat. It makes the difference when stopping for lunch. Feet - Be sure to get a good pair of hiking boots and a couple of pairs of hiking socks. The Whites are rugged, where you will be hiking up broken granite most of the time. Good traction and good fit are a must. Also, be sure to break in those boots before striking out by walking locally for a bit. You don't break in your boots, you break in your feet. Don't find out the hard way half-way through 10 miles of challenging terrain. Water - Most of the time there is water available to you if you have a water filter or other use sterilization methods. There has been a lot of giardia recently, so as refreshing as that cool stream looks, you are better off not drinking straight from it. I will usually pack 1-2 liters of water depending on the hike and bring a water filter with me to fill up when I find a source. First Peaks - Not all 4000 footers are the same and if you are just starting out, I suggest you start with something that is relatively easy and has a big payoff. Two really good starters are Mt. Moosilauke and Mt. Eisenhower. Camping and Huts - The rules for camping in the WMNF backcountry permit for lots of opportunity, however realizing it is a challenge. The Whites were clear cut over the past 150 years so much of the growth is relatively young. This means that walking 1/4 mile into the wood and dropping a tent is incredibly difficult. If it weren't for the trees being so close together, the rocks guarantee there is no flat ground. Back country camping sites exist, though may take a little looking. Often there are good sources of water and platforms. Hanging (alpine hammock) is a really good option in the Whites as well. Another unique option are the AMC Huts. This is an expensive option, but I recommend you try it once. It's a great experience. Night Hiking - Night hiking can be a little creepy at first, but the payoffs on a clear night are exhilarating. It is a real option and again an experience that should be tried at least once. Have a good headlamp, with extra batteries, and walk in. Seeing the stars and night sky at elevation against the mountain backdrop is a truly unique experience. Sun and Moon sets and rises can be stunning. Bushwhacking - It is tempting to bushwhack (go off the marked trail) to save some distance. If you are familiar with a map and compass this can provide a nice option. However often it really is "bushwhacking" and the terrain can be challenging. So don't undertake it if you are not prepared for it. Winter Hiking - Given the right gear, winter hiking can be some of the most enjoyable. The woods are quiet, beautiful, and less traveled. The hiking itself is also easier in many cases as the snow smoothes out the trails, turning a rock-hopping trail into one with a nice even grade. Again, hiking in the summer is dangerous due to weather and exposure, so be absolutely sure to be prepared with the right equipment and skills if venturing out in the winter.